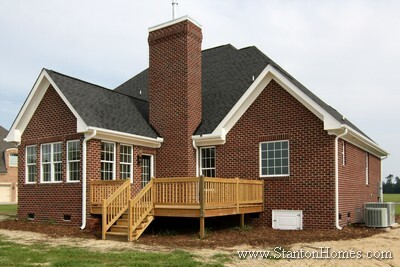 Thinking about building a new home in central North Carolina? 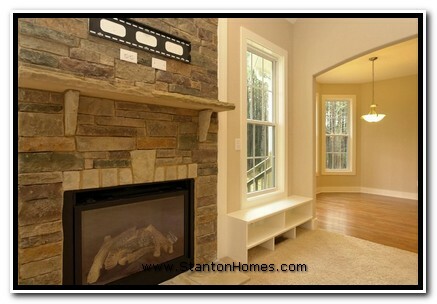 Chances are good your new home will have a fireplace as a focal point in the Family Room or Great Room. Even though fireplaces have decreased somewhat in popularity, more than half of today's new homes still include at least one fireplace. 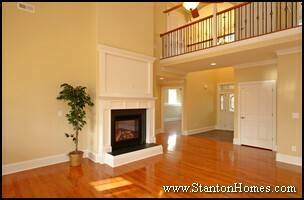 Some Stanton Homes even include two or more fireplaces, in Great Rooms, Keeping Rooms, Living Rooms, and Master Suites. 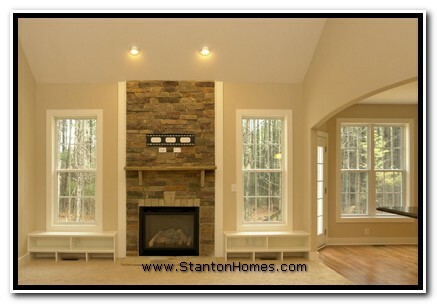 There are a wide variety of custom fireplace options - and Stanton Homes can custom design/build something unique just for you. Browse photos below, to get ideas for your Fireplace design. 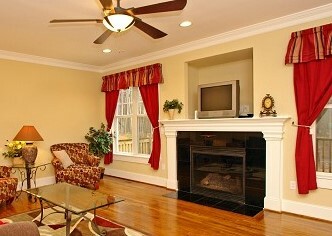 Your fireplace design (surround and mantle) can reflect your own personality throughout a variety of different budgets. 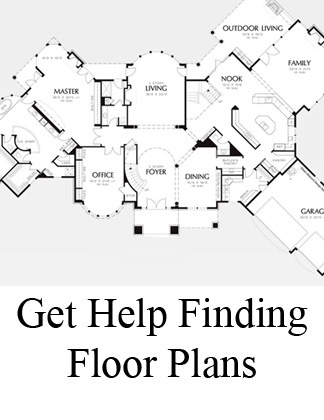 Contact us about your ideas for your new custom home! And remember, in the Raleigh area, check with your county restrictions before building - some counties have had restrictions on wood burning fireplaces due to air quality guidelines. 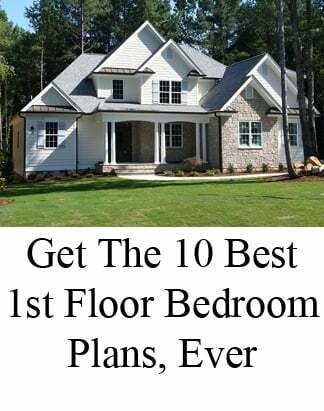 Thinking about a new home? 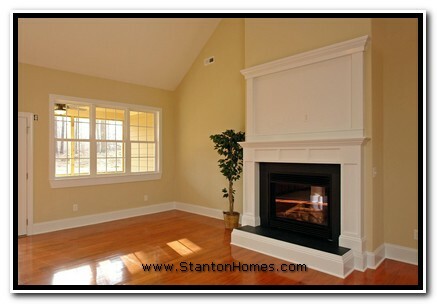 Chances are good your new home will have a fireplace as a focal point in the Family Room or Great Room. If you love a warm, cheery fireplace, choosing the surround can be very important! There are a wide variety of custom possibilities available. Here's a basic gas log fireplace with a marble tile surround and custom wood mantlepiece. 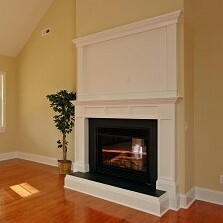 Above the fireplace, simplicity is key, with a cable outlet included for a flat screen tv. Want to stay flexible? Ask your builder to add a second cable outlet on another wall - the one above the fireplace can be covered with art work when the furniture is rearranged. 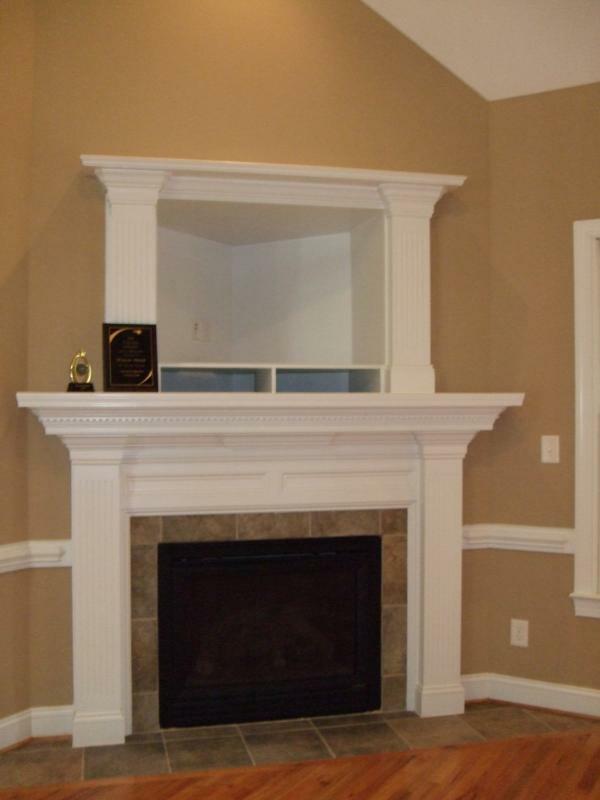 This fireplace features a built in entertainment center with cubbies for electronics. While this won't work for the largest of today's flat screen televisions, it will accomodate most moderate sized units. The custom tile fireplace surround adds color and texture, with the contrasting light colored grout. 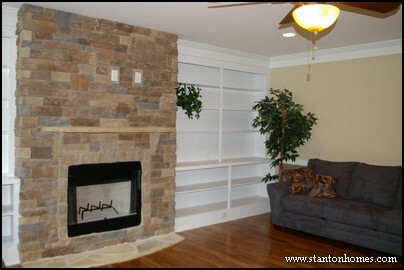 The mantle is extensive and roomy, with a secondary, accent ledge above the entertainment center. The cherry wood inlay around the fireplace hearth gives a great color accent and really sets this corner fireplace apart. 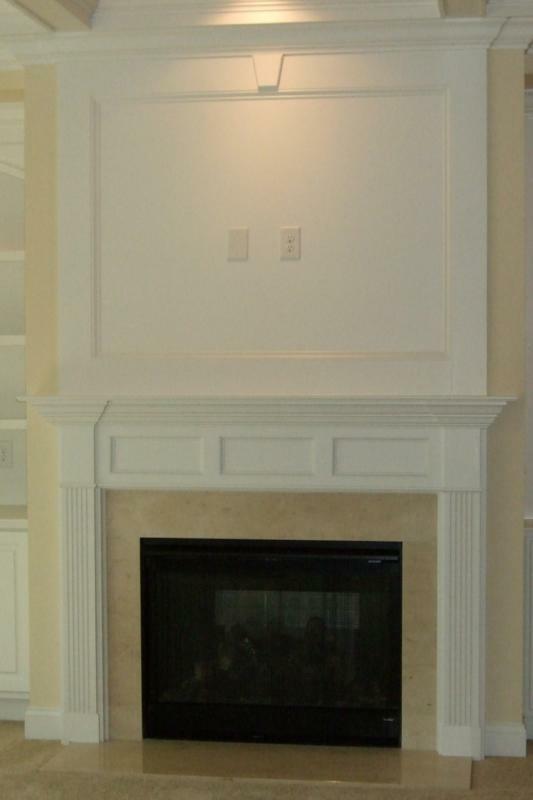 The minimalist mantle blends perfectly with the extensive trimwork through the home. Here's another fireplace surround option for that flat screen tv. Note the power and cable outlets ready for hook up. It's easy to include some crown moulding and other trimwork options to really set the fireplace/entertainment focal point apart. Want to liven up the room a bit more? Just choose a dark contrasting tile instead of light, or a warm accent trim color! A stone fireplace can be a bit more costly, but nothing comes close to the look and feel of stone in your new home. 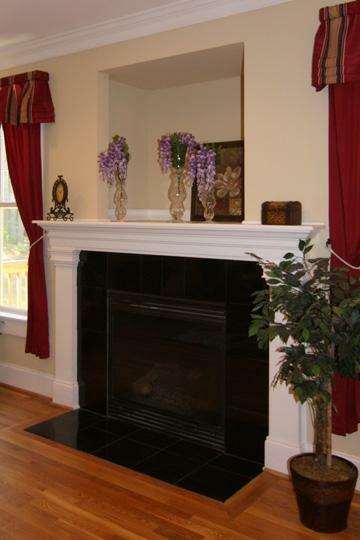 Mantles can be constructed of natural wood, white painted wood to match interior trimwork, or even stone. Cost depends on the type of stone, detailing involved, size of the surround, type of mantle, and size of the hearth. All these mantles and surrounds can be suitable for both gas burning fireplaces or wood burning insert fireplaces. In the Raleigh area, check with your county restrictions before building - some counties have had restrictions on wood burning fireplaces due to air quality guidelines. 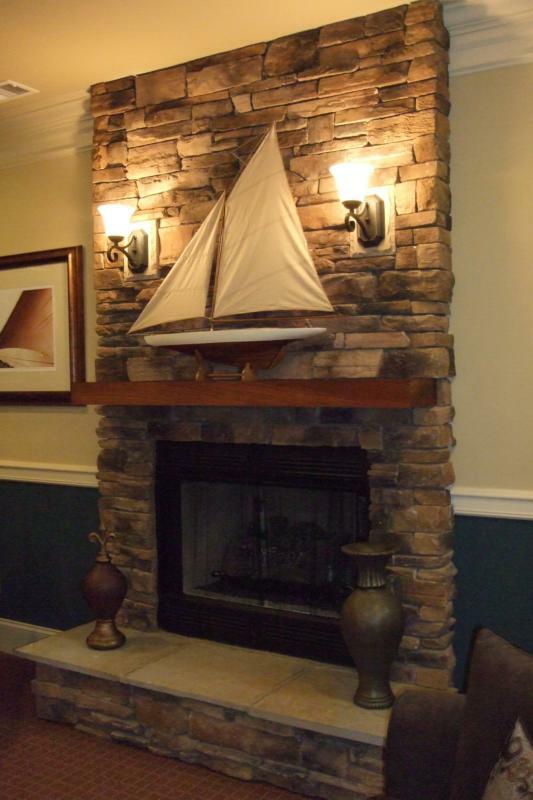 It's even possible to add a pair of wall sconce lights above the fireplace! This type of accent lighting can be especially pleasing in a basement rec room or other room that doesn't have as much natural light. There are many different styles of sconce lighting. Raised stone hearths are a little less common these days, but can still be very appealing. 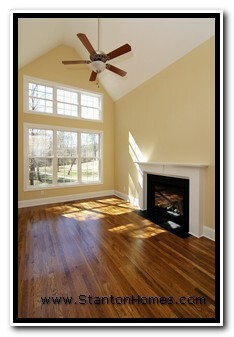 This dark slate surround really "pops" against the solid hardwood floors and the bright trimwork and neutral paint. The built in niche can have a variety of uses, from tv to art display. Your fireplace surround and mantle can reflect your own personality throughout a variety of different budgets. Contact us about your ideas for your new custom home! 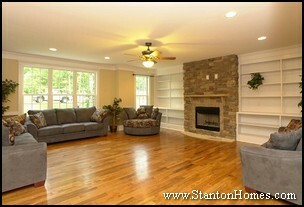 *All photos copyright Stanton Homes. Photos represent new home trends by a variety of home builders. 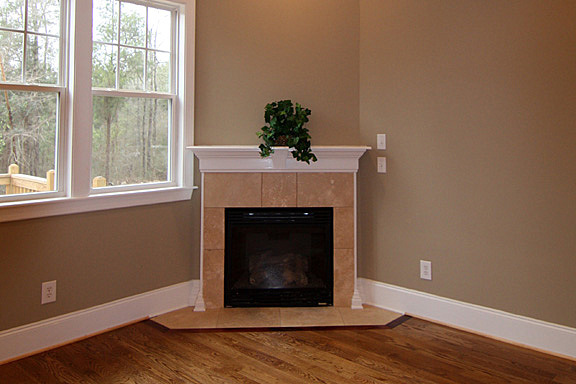 If you're thinking about a new custom home, chances are fairly good that you'll be including at least one fireplace. But what type of fireplace do you have in mind? 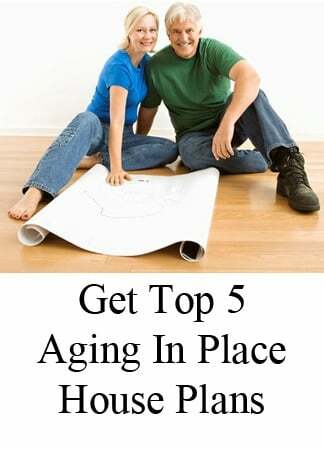 Here are a few basic ideas to get you started. In most cases, you'll start with an elegant, simple fireplace design. 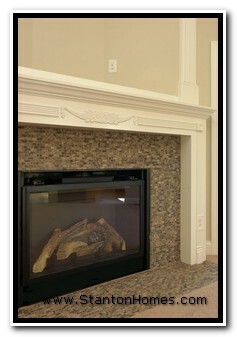 This gas fireplace is set off with a black slate surround with matching hearth, and a custom, site-built mantlepiece. For old world sophistication, consider a mosaic tile. This type of fireplace surround is more labor intensive, but well worth a little additional cost. In this example, a mini-mosaic was used, with a fabulous mixture of dark and light textures. The site-built mantle and surround includes an entertainment niche with decorative columns. 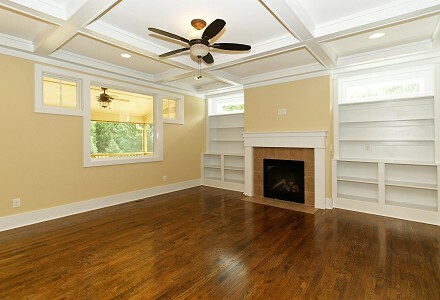 The fireplace is often the focal point of the room, and an oversized fireplace can make a vaulted room even more cozy. 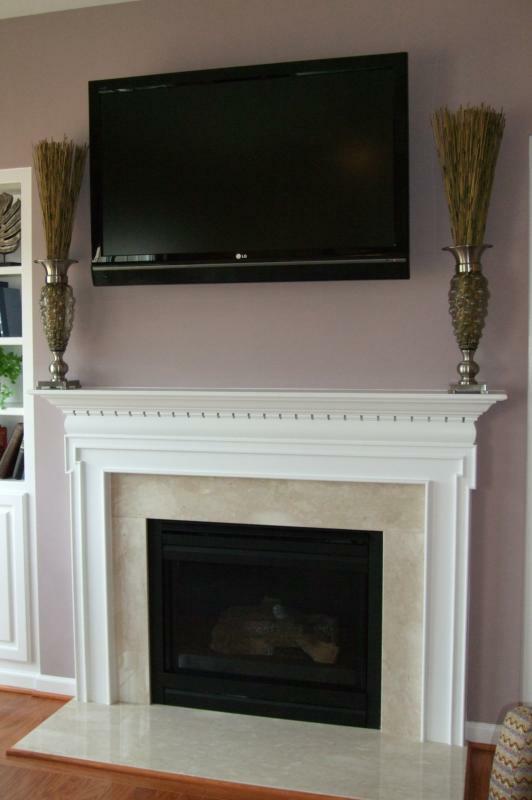 Here, a raised hearth and intergrated, completely trimmed tv area make this fireplace a masterpiece. There's nothing quite like a stone fireplace surround for a special look. Whether you're aiming for a rustic lodge or a classic, timeless feel, stone is an excellent choice. Here, note the stone hearth, matching stone mantlepiece, and keystone accent over the fireplace. And stone doesn't mean the tv has to move - ask about having your tv support installed ahead of time. Your fireplace, surround and mantle can reflect your own personality across a variety of different budgets. 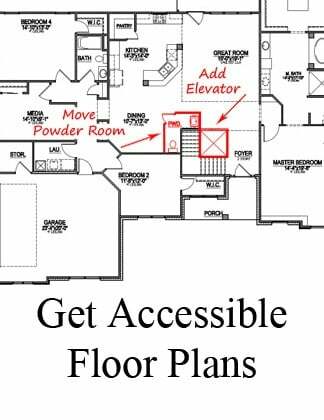 Ask your builder for ideas that will work best for your new custom home!